January 20th, 2019 - Preorders Now Available!! is now available for preorder from www.MythosOccultus.com. 10 tracks of haunting, ferocious, and relentless black metal from the USA!! Available on Limited Edition DigiPak CD, and 2 different Limited Edition Cassette Tape versions. Mixed and Mastered by Dan Swanö at Unisound Studios AB. May 23rd, 2018 - Live Ceremony at San Diego House of Blues. NECROCHAMBER's long anticipated debut album, "Ceremonies for the Dead" (due out in early/mid 2018) will be getting mixed and mastered at Unisound Studios AB in Sweden by none other than legendary songwriter, musician, and producer Dan Swanö. It was an obvious and good choice and we're looking forward to working with Dan to give our music the energy, intensity, and production it needs. More necro-news to come! New 2017 interview with Nocturnal Overlord from Archangel's Lantern. 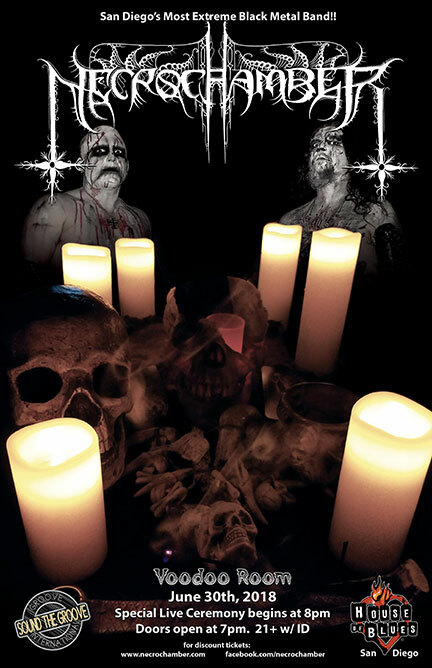 Necrochamber initiates drummer Wotan (Vile, Warface, Obelisk) into the line up. October 8th, 2007 - www.Necrochamber.com launched!! Official NECROCHAMBER webpage has been launched. More updates to come.